What is a Clumping Litter? Clumping cat litters are generally non flushable, such as the clay type. The main characteristic of clumping cat litter is the fact that they form firm clumps when in contact with urine or feces, keeping the surrounded litter clean. However, the litter box needs to be emptied and refill with new litter every 15 days or so to prevent bacteria formation. Most clumping litters are made from granulated bentonite clay which gives them the fast clumping characteristic. Clumping litters help saving on litter since only the clumps in the litter box need to be scooped, leaving the rest of the clean litter in the cat box. Ever Clean Premium Cat Litter is a balanced combination of pure natural clay and minerals creating a 99% dust free cat litter. This cat litter is made from selected natural components in the formula, including carbon/charcoal. Ever Clean unscented comes in sizes 14 lbs, 25 lbs and 42 lbs. Ever Clean’s granules contain bentonite clay, activated carbon/charcoal and borates. The activated carbon goes through a manufacturing process which puts the carbon inside the clay granules. This process is called “agglomeration” and gives Ever Clean’s litter the capacity to absorb and hold odors. Additionally, the formula contains an odorless antimicrobial agent to prevent bacteria formation. The consistency of this litter is a sand type that clumps effectively, and due to the carbon filter inside the clay granules, all the moisture gets held, creating clumps that won’t break apart when scooping. √ Unscented, ideal for people who don’t like fragrances. Ever Clean Extra Strength is a very good clumping litter that will absorb and hold odors creating firm clumps that are easy to scoop. This litter box is a little pricey but it works as advertised in absorbing odors and keeps the litter box fresh. There is still a little dust when pouring to the box but it’s still a low level of dust that won’t cover the whole room. Dr. Elsey’s Precious Cat is a premium clumping clay litter with a balanced formula created to minimize tracking litter, combining heavy granules and medium grain. 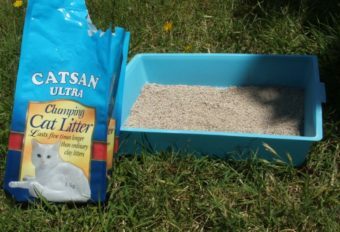 This special formula keeps the clumps from sticking on the bottom of the litter box and at the same time, it forms clumps that don’t break apart while scooping. This Ultra version clumping litter handles lots of urine and feces so it’s suitable for use with several cats and also performances well when used with automatic litter boxes. 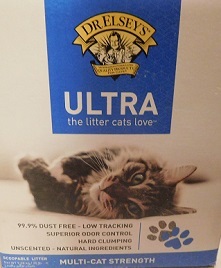 Dr. Elsey’s Precious Cat litter helps you to keep your cat litter box remain odor free, without creating intrusive perfume smells in the environment. It comes in sizes 18 lbs and 40 lbs. Dr. Elsey’s Precious Premium cat litter is made from 100% natural bentonite clay which gives it the clumping characteristics. The formula has been created to keep a balance between the absorbing and clumping properties and the litter’s heaviness to keep the litter tracking reduced to the litter area. The litter when in contact with liquids or wetness forms hard clumps that contain and seal the humidity, keeping this humidity mostly on the surface, not reaching the lower layers of the litter. 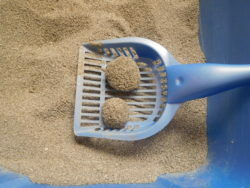 X If not using the right amount (3-4 inches deep) the clumps stick to the bottom of the litter box. 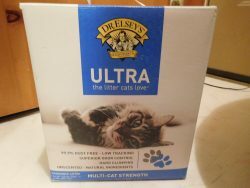 Dr. Elsey’s Precious Cat Ultra Premium Clumping Cat Litter is an excellent formula that works as advertised. This brand is the best sellers of its type. 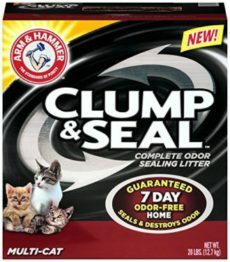 Arm & Hammer Clump & Seal clumping litter is well known for excellent odor control and strength to clump urine and feces. The Clump & Seal version covers effectively ammonia and feces odors due to the sealing and odor destroying the power of the formula. 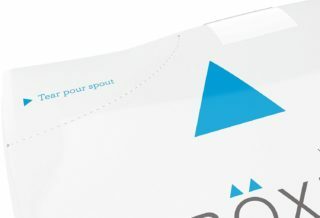 Also, the litter creates firm clumps that allow you to scoop them easily, without the clumps breaking apart and spilling from the scoop, so common in other litters. This formula is ideal for multi-cat households due to its clumping fast action. This litter is lightly scented with a fresh floral aroma that doesn’t invade the room or litter box area. It comes in sizes 14 lbs, 19 lbs, 28 lbs and 38 lbs. The formula of Arm & Hammer Clump & Seal is clay based with a blend of moisture-activated micro granules that seal and contain urine and feces with firm clumps. Also, the formula has a heavy-duty odor eliminator and Arm & Hammer baking soda that destroys odors on contact. The consistency of the litter is gravel to sandy, with a soft feel on your cat’s paws. This fine texture of the litter sifts easily through the scooper, leaving only the firm clumps. With this special formula, the urine clumps take the form of small balls (as seen in the picture), allowing to clean the litter box easily. Arm & Hammer Clum & Seal clumping litter it’s an excellent cat litter that will provide you the best odor control and will keep the litter area fresh for a week with a daily cleaning of the litter box. This litter works as advertised regarding clumping and odor control. As long as your cat covers its urine and feces, this litter will keep the litter box odor free. This clay clumping cat litter is soft and easy on your cat’s paws, especially suitable for declawed cats. One of its main characteristics is that cats take easily to this litter, keeping a low amount of dust and helping to reduce the litter tracking due to its heavy weight. 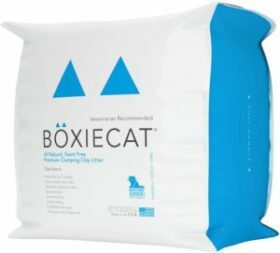 Boxiecat is a healthier option for cat owners that prefer a clay cat litter with hypo-allergenic natural ingredients that don’t have harmful chemicals or additives. This cat litter comes in sizes 16 lbs and 28 lbs. The varieties are unscented, gently scented and extra strength odor control. This review is for the unscented. Easy to manage 16 lbs bag with zipping to reseal. Duration 28 lbs bag + 2 cat = 1 month approx. Duration 16 lbs bag + 1 cat = 1 month approx. The special formula creates a hard flat surface that doesn’t allow liquids to leak onto the bottom. The litter creates firm clumps that don’t break down while scooping, avoiding the mix of a dirty litter with clean litter. Boxiecat litter has been developed with a dust suppression technology to reduce dust when pouring and when your cat digs in it. Clumping on litter surface technology is a “con” when the wet litter gets in contact with the sides or the edges of the litter box, it sticks to it like glue, making it very hard to scoop. Boxiecat works as advertised regarding hard clumping on the surface of the litter, but it seems like the odor control is not optimal and the dust is low but not dust free as advertised. 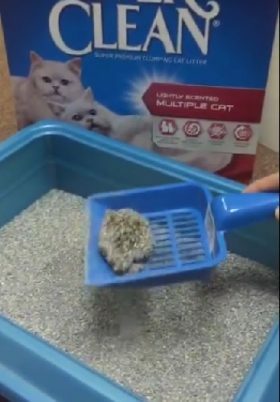 This clay clumping litter forms big hard clumps to isn’t recommended to use with a rake type automatic litter box due to the effort the machine’s motor would need to do, but it may work better with an automatic rotating litter box system. 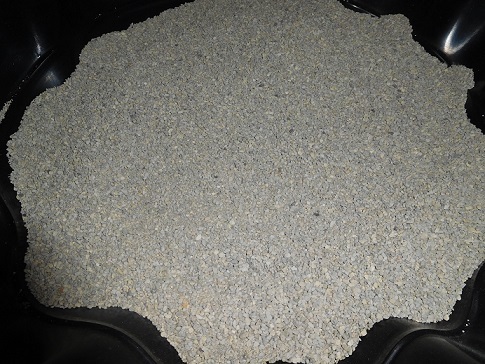 However, as this litter is heavier than others and consequently you will need to put less in a rotating mechanism, it may not work very well if your cat likes a deep litter bed, so if you use this litter with a rotating auto litter box make sure your cat doesn’t mind a shallow litter bed. As a note, to fill one large regular litter box you need one 16 lbs bag so you may want to consider on buying the bigger size of 28 lbs not to run out of it. Boxiecat is a good clumping litter for cats that need a softly sanded litter and for cats that don’t take easily to any type of litter. This litter may not be suitable if your cat is used to urinate on edges of the litter box. A good thing is that you can save money in Amazon if you buy this litter through Subscribing & Save. Clay Clumping. These litters are made from bentonite and are not flushable. These litters create solid clumps that absorb and retain humidity making it easy to scoop and clean the litter box. Some claim that clumping litter could pose a health risk to pets when inhaled or ingested in small amounts, but there is no scientific evidence that can support this claim, even the ASPCA (American Society for the Prevention of Cruelty to Animals) using clumping litters for years hasn’t had or presented any case of health issues with clumping cat litter. If you want to use an automatic self-cleaning litter box, clay clumping litters are the most suitable for this purpose. Pine and Cedar based litters. These litters are environmentally friendly and smell very nice. Cats love the wood smell which attracts them, but this nice smell disappears when in contact with urine or feces which creates a stinky litter box. Another problem with this type of litter is that they are sticky and create tracking not only on the cat’s paws but around the house and they are hard to scoop because the clumps break apart almost completely. Corn-based litter. This litter has an unusual smell of litter that isn’t a fragrance or anything like that. Corn-based litter does very little to cover cat’s waste so extra odor destroyers are needed to keep the litter box’s odors under control. Corn litter is very lightweight and creates corn dust that can elevate up to the door if your cat digs enough, covering also the cat itself. The worst part is that corn-based litters help in developing feline acne. Crystals. This litter has a good capacity to absorb liquids but its consistency isn’t soft on the cat’s paws and some cats hate using this litter. If your cat has sensitive paws it could even develop behavioral problems and refuse using the litter box. Pellets. 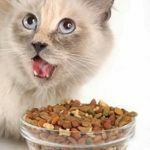 Either silica, newspaper, etc, pellet shaped litters made from any kind of material pose the risk of the cat chewing on them and eat them, plus cats don’t like using the pellets that much, especially when time to dig and cover their feces or urine.